For part of the year I ran a series of posts about “crackpots who were right” . This was the conclusion and it made it to number 10. The series as a whole did very well but none of the other individual posts were as popular. I also had a short but popular series of posts about conservation of energy in general relativity in which I argued at length with a number of other physicists who thought otherwise. This included a nice equation that shows how energy conservation works in a standard cosmology, something that many people claimed was not possible. In an additional post I debunked a claim by Lawrence Krauss that energy is zero only in a flat universe, a claim that he had used to debunk religion! Krauss graciously responded but sadly I could not draw him into a longer discussion. 8 – Suzy at Last? With many posts about the Large Hadron Collider and progress on its commissioning, it was a good time to speculate about what it might soon find. Personally I favour supersymmetry although we now know that this year’s data has only served to constrain the allowed parameter space. It will be interesting to see what come up next year. An especially nice outcome of this post was that I got to have a pint with Mike Duff and his students and talk about M-theory and their work on relations with quantum information theory. This inspired my recent contribution to the FQXi essay contest. The BBC ran a program about various theories proposed by a number of high profile physicists about what existed before the big bang. It was a bit misleading and unbalanced since it ignored the fact that many cosmologists still think there was “no before”. Some people don’t like these kind of highly speculative theories and think it is bad science, but I think you have to be prepared to think outside the box and see where it takes you so that in time the correct theory can be found. So on the whole I thought it was a good program. I was the first to blog about the paper by Penrose and Gurzadyan who claimed to have found circles in the WMAP CMB data. This was later disputed by other cosmologists but I don’t think the matter is completely resolved. Perhaps the more detailed data from the Planck observatory will answer the question when it becomes available. An interesting aspect of this story was the fact that peer-review had no part in it. The paper submitted to the arXiv and underwent blog review. Do we still need the journals? This was claimed proof of the well known mathematical problem that carries a million dollar price tag. Deolalikar is an independent mathematician who works for HP. They issued a press release about the discovery that got a lot of attention. The validity of Mathematical proofs is easier to resolve than physics theories and in this case the proof was found wanting after heavy discussion on other blogs. Again the official peer review process was not needed. Although there were not many comments here the interest in this story was so high that it made it to number three. When the fields medals were announced I was one of the first to report the results. One field medallist in particular became a national hero in his home country of Vietnam and there was a lot of interest from there making this the second most popular post of the year, wow! And finally the most popular post was appropriately my anti-crackpot index designed to counter the Baez crackpot index. I have a feeling that this one will continue to get hits for a very long time. My essay on the question “Is Reality Digital or Analog?” for FQXi has now made it online . It’s about how the universe could work like a quantum computer, and how this might be realised in string theory. Of course it is speculative and philosophical in nature but that is what these FQXi contests require. The claim is supported by a demonstration that the one-loop partition function for bosonic string theory is the same as the partition function for a system of four qubits. This is derived from my work on the relationship between hyperdeterminants and elliptic curves. I’m going to disable comments on this post in the hope that people will use the comments system of the FQXi forum instead if they want to say something. 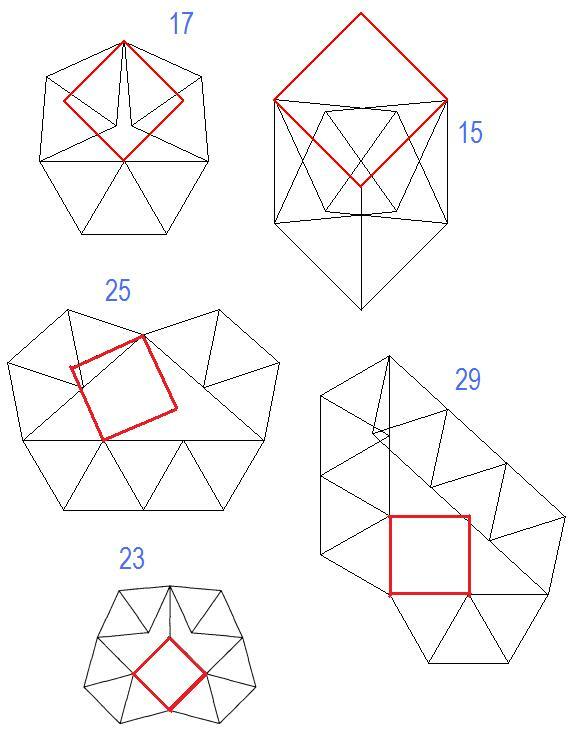 Construct a square from four identical linkages hinged at the corners. Such a figure is capable of moving on its hinges to become a rhombus. 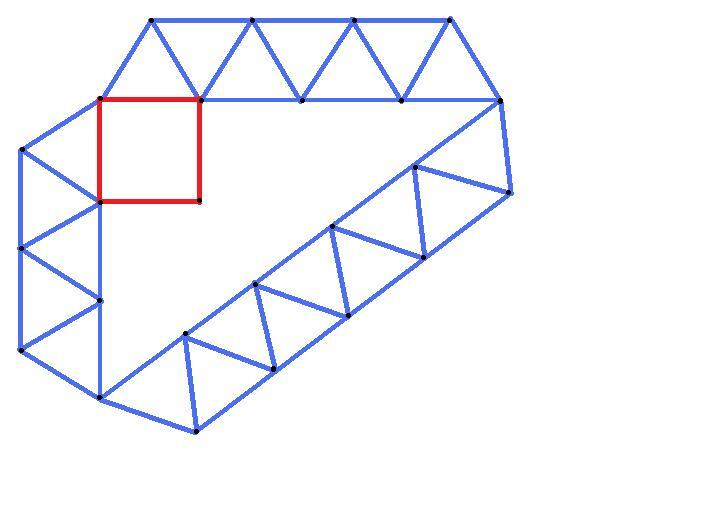 How many linkages of the same length must be added to make the square rigid? The linkages must be in the same plane as the square and each one can be connected only at the hinges. My best solution so far has 43 extra linkages which must be far too many. Update 28-Dec-2010: Lubos has given a nice solution with no overlapping links which requires only 31 extra edges or 29 if you allow the links to cross. However I have found out that this is still not the best solution for the case where overlaps are allowed! so keep trying. Final Update: Since posting this puzzle I have learnt that a version of it was posed in Martin Gardner’s SciAm column in 1963. His version required that the bracing links do not overlap. Seven readers sent in the solution with 23 added links shown below. Erich Friedman considered the case where links can cross in 2000 and posted results on his Math Magic website. His best solution had 17 extra links. However, someone later informed him that Andrei Khodulyov had found a solution some time ago with just 15 extra links. Well done to all those who posted solutions here and over at The Reference Frame. In some cases we have seen plots using almost all of the 45/pb of data so far collected. The summary is that so far no new Beyond-Standard-Model discoveries have shown up. Some new limits have been set for exotic particles and the allowed parameter space for SUSY has been trimmed down. The lack of black holes in particular has led to a flurry of headlines saying that string theory predictions have failed. On this subject I am fully in agreement with Lubos when he says that very few theorists expected (including string theorists) expected to see these black holes. They are part of a speculative theory about large extra dimensions. It has some interesting features, but it is not a definite prediction from string theory. Lubos has also pointed out that some results from the Tevatron are favouring a SUSY Higgs sector. The elimination of some SUSY parameter space is not a big deal for SUSY supporters. There was always a possiblity of SUSY showing up at this point, but it is much more likely to appear with more data. Until the Higgs sector has been fully explored and understood by the LHC, everything is to play for. The Large Hadron Collider ended its 2010 physics runs on 6th December last week and has now shut down until February. For the rest of the week the LHC beam teams met up in Evian to open discussions on how to run the LHC throughout 2011 with the goal of collecting at least 1/fb of integrated luminosity. The slides from the full set of talks can be found on the CERN indico server. Towards the end of the proton runs this year a peak luminosity of 0.2/nb/s was reached. If they could run very efficiently during the year this would be enough to collect 1/fb, but that is too optimistic. To be confident of reaching the target they will aim for a peak luminosity of 1.0/nb/s. There will also be a small increase of the collision energy from 7 TeV this year to 8 TeV in 2011. Reaching a luminosity of 1.0/nb/s will take some time and hard work. The increased performance will come from several factors, but the main ones will be an increase of bunch numbers up to 930 per beam and a tighter beam squeeze down to beta* of 2.0m or less. Last year they reached 368 bunches using a bunch spacing of 150ns. To get more bunches in they must decrease the bunch spacing and at the end of last year they already tried 75ns and 50ns spacing. This was not without problems, but they think they can manage 75ns runs for next year to fit in the 930 bunches. To implement these new parameters there will have to be a completely new beam and collimator setup. Last year it took about three weeks in August to perform the commissioning for the parameters used in the final runs and they expect a similar time next year. That will be followed by a gradual build up of luminosity by increasing the number of bunches. According to a scenario suggested by Mike Lamont, first they will go up in steps of 50 bunches until they reach 300, then in steps of 100 until 900 bunches. This would take another six weeks to complete (This obviously not intended to be a precise plan since they normally go up in multiples of 24 bunches.) This means that full operating conditions will not be reached until May. After that the amount of data they can collect depends on how efficiently they can run the collider for the remaining 6 months of proton runs. A draft schedule can be found in the talk by J. Wenninger . Unfortunately there are no slides for the closing words from Mike Lamont and Steve Myers. There remain a number of issues that will make the run for 2011 challenging. The famous “Hump” is still causing some problems and its cause is unknown. The UPS (Uninteruptable Power Supply?) is a suspect but the unusual pattern of the interference is hard to explain. They are working to pin down the true frequency of the signal by oberving its effects and are using magenetic probes around the ring to try and pick it up directly. The beam damping systems have largely removed the problem of the hump, but it still has some potential to destabalise the bunches and reduce luminosity. Hump spectators can read the slides of G. Arduini for full details. Other problems considered include the UFOs (Unidentified Falling Objects) which may be cleaned out by running some high intensity beams for a while. The e-cloud is another big issue that was found at the end of the runs this year. It is a build up of electrons that leads to unwanted background collisions near the detectors. No doubt some work will take place during the shutdown to help address these and other problems for next year. Final decisions on run parameters and schedule will be taken at the Chamonix meeting in January. Meanwhile, a conference on LHC First Data is scheduled for next week! Since the Large hadron Collider started physics runs early this year, the plan has been to run to the end of 2011 in order to collect 1/fb of data at 7 TeV. After that the collider would shut down for over a year to upgrade the magnets before allowing it to run at its full 14 TeV. But the plans at CERN for the LHC have always been somewhat flexible. Now with Fermilab hoping to extend the running of the Tevatron in order to scoop the LHC to the discovery of the Higgs, CERN are fighting back with talk of an extension of the current run that might find the Higgs even sooner. This year the commissioning of the LHC has run somewhat better than hoped. 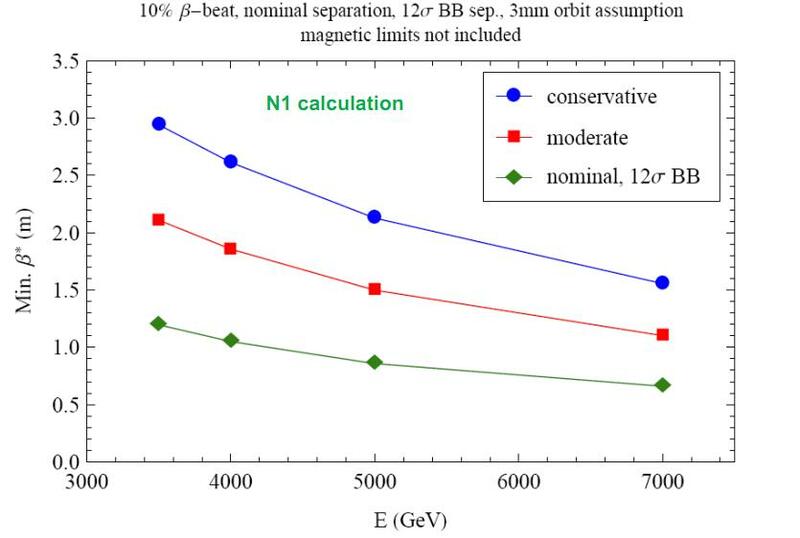 In July when they stepped up the beam intensity they found it easier than expected to get to the designed count of 115 billion protons per bunch circulating in the ring. This meant that they could reach their target luminosity of 100/μb/s without stretching other parameters to their potential limits. By time the proton runs came to an end for the year, they had reached twice that target and were already trying out procedures to go to higher luminosity next year. With so much optimism in the air they have recently been talking of increasing the energy to 8 TeV during 2011. Projections suggest that they may be able to collect between 2/fb and 7/fb at that energy if they can live up to expectations of run efficiency. This would make the discovery potential of next year’s run much better than anticipated and so the payoff for continuing the run is much better. With such considerations in mind the CERN directorate is now proposing to extend the run to two years instead of just one, taking them to the end of 2012 before the long shutdown. It remains to be seen how this will affect the decision at Fermilab to continue their run. Although they have expressed a strong wish to continue, they can only do so if they can find an extra $150 million and it is not clear where that will come from. Even if the money arrives as a new budget, other experiments at Fermilab will be held back by the continued running of the Tevatron. Not everyone thinks this is the best way forward for the lab. As a successful run of Heavy Ion collisions enters its last few days at the LHC, the beam commissioning teams are now preparing their cases for how to run the collider when it starts up next year. A meeting at Evian on the 7th-9th December will be used to go over the possibilities with final details to be hashed out at Chamonix in January. The LHC is then expected to restart proton physics in February. Meanwhile there will be some conferences to present any physics results they have using the 40/pb of data collected so far such as the “LHC First data” conference in Michigan on 12th December. (This does make me wonder how many more times the words “LHC” and “First” can appear together in a title.) We should not expect new positive results unless the physics gods are unusually kind with their favours. As the year comes to an end let’s take this opportunity to thank CERN for allowing us such an open public view of the workings of the accelerator. We also thank the physicists who work on the detectors for bringing us their initial results so quickly. We look forward to so much more next year and beyond. You are currently browsing the viXra log blog archives for December, 2010.